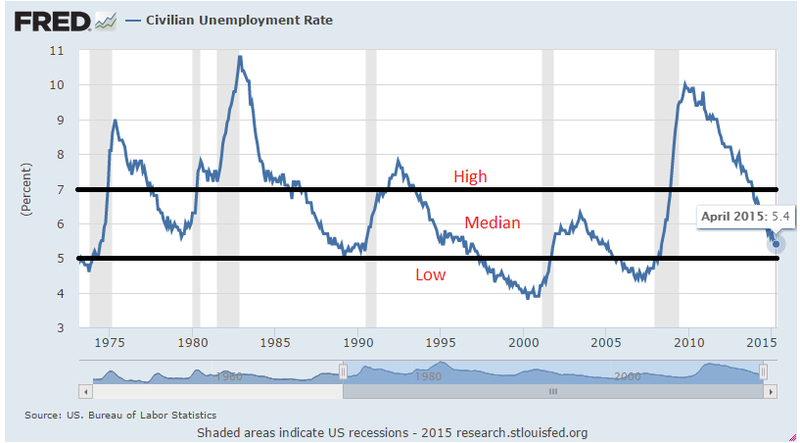 US Unemployment is falling off a cliff and headed into historically low territory. Today the rate of unemployment is a cool 5.4% which is a healthy and sustainable level based on historical averages. Not only is unemployment cascading lower, actual wage inflation is no longer stagnant. Over the past 12 months wages and salaries have increased 4.75%. Despite our increasing population, today there are more Americans fruitfully working than at any other point in the history of this great nation. Not only has our employment situation substantially improved, each American as a whole is wealthier today than ever before. 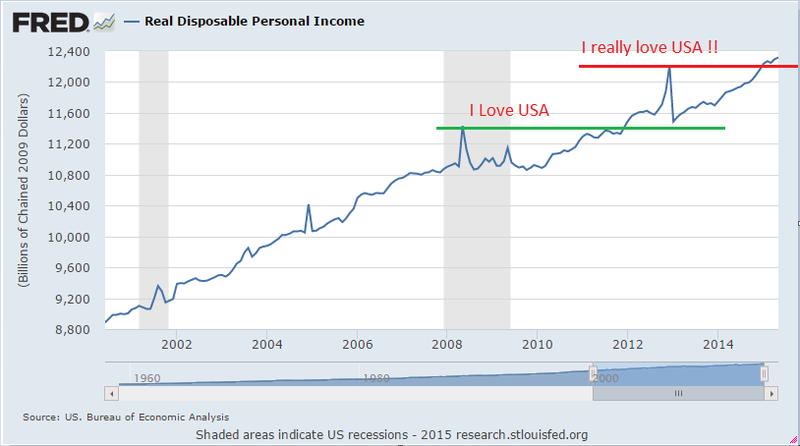 The chart above demonstrates Real Disposable Income which is a better measure than Real GDP (Gross Domestic Production) for measuring individual citizen’s wealth. The chart illustrates a picture of a U.S. economy doing quite well. Our command over resources in the world should be measured by our real income and not by real GDP. Improved terms of trade, such as cheaper imports and a strong currency, give rise to our real income regardless of our productivity or output. The goal of economic policy should be to maximize the present value of real income. It is just as important to give U.S. Consumers access to cheap foreign goods as it is to make real GDP larger. At present all is well and when we look forward over then next 12 months the situation is also promising. 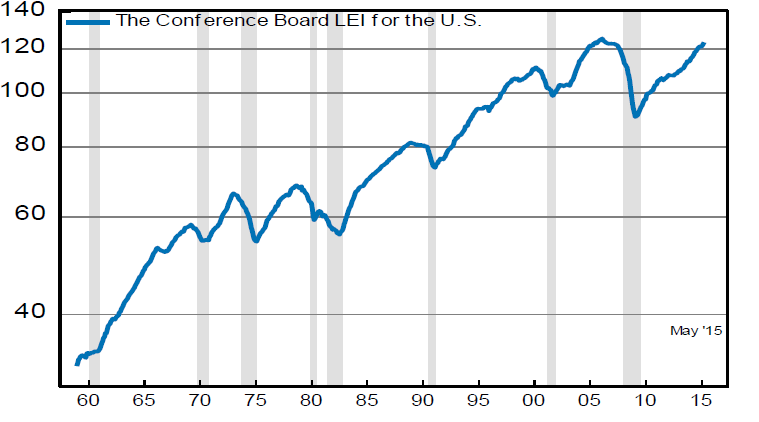 One of our favorite forward looking indicators which have done a great job at estimating a potential recession are the Conference Board’s Leading Economic indicators (LEIs). See chart below. The composite indicator is comprised of the key elements in an analytic system designed to signal peaks and troughs in the business cycle. The analytics are constructed to summarize and reveal common turning point patterns in economic data in a clearer and more convincing manner than any individual component – primarily because they smooth out some of the volatility of individual components. The U.S. LEI increased sharply again in May, confirming the outlook for more economic expansion in the second half of the year after what looks to be a much weaker first half. The major contributing components were new building permits and rising interest rates from new mortgage demand, a further indication of a housing recovery underway. Last year in prior newsletters we discussed Fair Value of the S&P Benchmark to be 2,100. This number is an estimate based on the actual and projected earnings of all fortune 500 companies within the benchmark and it has stood the test of time. The markets behavior is in line with our expectations as it has meandered slightly above and below fair value for over 12 months, unable to move beyond fair value and providing no positive returns. In order to exceed fair value, earnings and growth rates of the companies reporting must rise. Despite what other economist might say, a rapid rise in interest rates tend to slow down the rise in equity markets as we will explain. Below is a chart of the 10 year US Treasury note. The recent rapid and large move up in interest rates has indeed caused the stock market to stall due to a narrowing of the Equity Risk Premium. When taking the total earnings of the S&P 500 companies and dividing it by the index price we get an earnings yield of 4.95% as of this writing. Historically, when the S&P earnings yield is above the interest rate of the 10 year US note, equity markets are better performing long term investments than bonds and this difference is what we call the Equity Risk Premium. 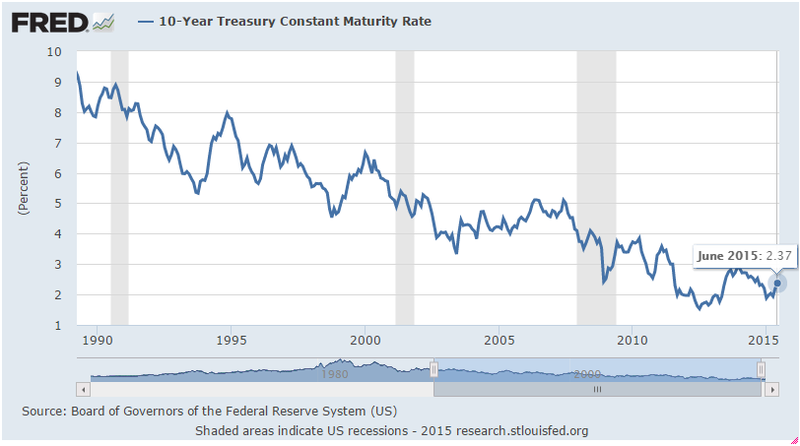 Currently the interest rate on a 10 year bond is at 2.4%, well below its long term average of 6.4%. Thus, the “risk premium” to hold stock is positive as 4.95% is greater than 2.4%. It is only when the risk premium is less than 1 or negative that one must be extremely selective in stock investments. At QCI we are selective regardless. It is those index and mutual fund investors who purchase the broader markets who suffer the most when the Equity Risk Premium is not favorable. This is because there is no attempt to make selective concentrated investments in companies that have an earnings yield greater than the Equity Risk Premium. Our outlook is positive with a resumption of the uptrend once corporate earnings regain traction and growth expands. We are currently experiencing an intermission within a long term expansive business cycle. Investors must understand returns are never linear but vary over time. Patience is critical if long term goals are to be achieved. Given our analysis we project no recession over the next 12 months. 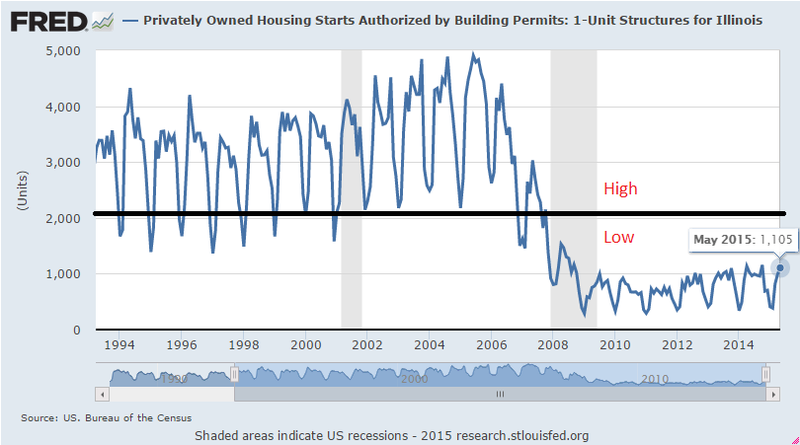 As illustrated from the chart above, housing starts have been well below their historical levels which will inevitably lead to an increase in the cost of renting an apartment and purchasing a new home in the future. There are simply not enough new housing starts to keep up with rising demand. Existing renters are already witnessing these rising costs, and they shall only be exacerbated from those who are moving out of their parents’ home and looking for an apartment after moving in with them in 2009 and 2010 during the last great recession. Vacancy rates are a good signal of supply and demand in rental market. 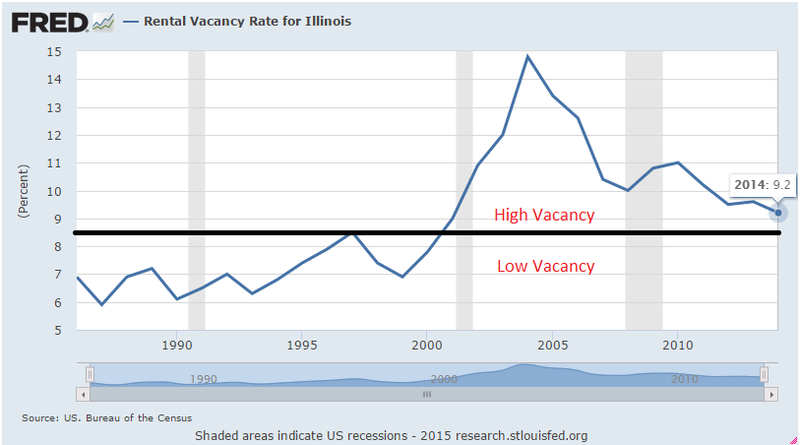 While vacancies have dropped considerably, the amount of supply is still above the historical mean. As wage inflation increases and the slow buildup of new homes under-paces demand, vacancies will accelerate lower and are projected to hit the pre-real estate bubble of the 2000s by 2017. There are a handful of publicly traded companies well positioned from this emerging long term cylce and QCI is ready and prepared to invest in these select companies with exposure to the emerging trend. If you have any questions regarding our newsletter, or would like a comprehensive portfolio review and update of your financial plan please feel free to contact us. We also provide complimentary review of personal and business state and federal tax filings to assist you in lowering your state and federal tax obligations with sound tax reduction planning strategies.